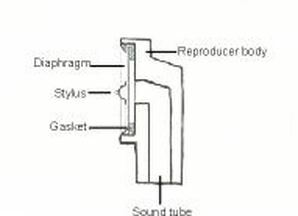 The sound reproduction of an acoustic Phonograph and Gramophone starts with the stylus or needle that is attached to the Reproducer or Sound box. Basically they both operate with the same system. A diaphragm is made to vibrate in a tube, the sound of the vibrations are passed to the horn that increases the volume depending on its length. Sketch (1) shows a basic floating reproducer as used by Columbia, Pathe, EWC, Thorens and many other manufacturers. 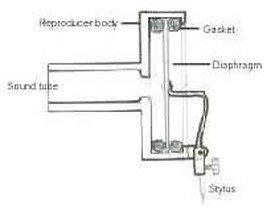 Sketch (2) shows an Edison Reproducer. Sketch (3) shows a basic Sound Box. There are many variations of Reproducer and Sound Boxes they are all based on the above principals. 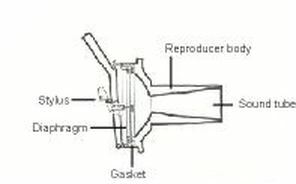 The most important requirement to obtain the best result from any Reproducer or Sound Box is that there be no slackness in any of the mechanical joints and that there is no undue pressure on the Diaphragm to distort it.